The first step in signing up to any of our plans is to book your Gas Boiler Service, to ensure that everything is operating safely and efficiently. 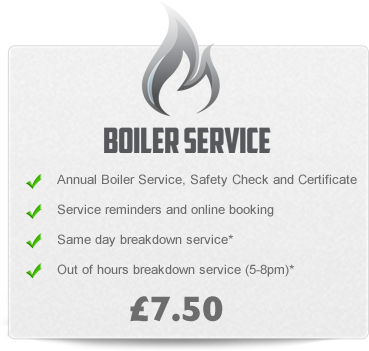 The cost of a Boiler Service Plan is £7.50 per month with a £6.00 setup fee. This 12 month plan represents a minimum payment and is payable by direct debit. Our Boiler Service Plan includes a chargeable same day breakdown service for peace of mind if things go wrong. If you are looking to upgrade from a simple Boiler Service Plan to any of our Protection Plans we will need to carry out some system checks and visual inspections to make sure everything is in order. There is no extra charge for these additional checks carried out with your Boiler Service and assuming that your boiler/system meets the set criteria our engineer will then sign you up to your chosen Plan. Once accepted on your chosen Protection Plan you will not only benefit from a same day priority breakdown service but also inclusive parts and labour* if things go wrong. All plans include an annual Boiler Service. Please select the BGM Care Plus Plan that you feel would best suit your needs from the list below. We look forward to welcoming you onto your chosen plan and we promise to deliver an outstanding local service that we are sure you will find very difficult to beat. *Parts and labour are included subject to plan type, terms and conditions and certain exclusions. Our Boiler Service Plan is great if you are looking to spread the cost of your gas boiler service over the year with the added benefit that if things go wrong we will be available to visit on the same day to put things right. Under this plan breakdowns are charged at our standard rates. £7.50 per month (£6.00 set up fee). Our Boiler Protection Plan includes an annual gas boiler service and a same day priority breakdown response as well as the added peace of mind knowing that if things go wrong the cost of any repairs to your gas boiler are covered in full, parts and labour*. 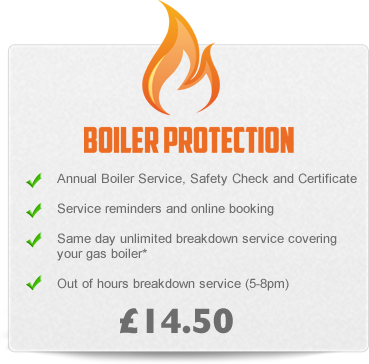 Under this plan boiler breakdowns are covered, system breakdowns are charged at our standard rates. 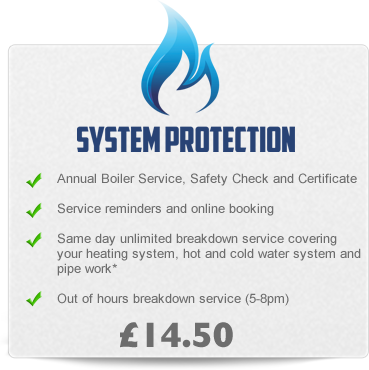 Our System Protection Plan includes an annual gas boiler service and a same day priority breakdown response as well as the added peace of mind knowing that if things go wrong the cost of any repairs to your heating or hot and cold water system are covered in full, parts and labour*. This plan is ideal if your gas boiler is under a manufacturer's warranty. £14.50 per month (£12.00 set up fee). 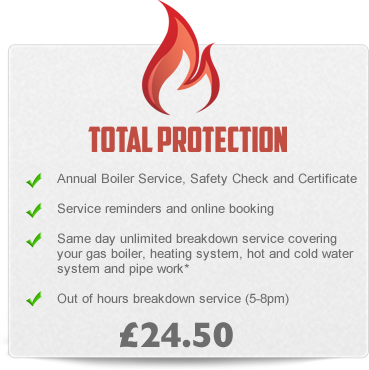 Our Total Protection Plan includes an annual gas boiler service and a same day priority breakdown response with complete peace of mind knowing that if things go wrong the cost of any repairs to your gas boiler, heating or hot and cold water system are covered in full, parts and labour*. This plan is our top level of cover and is intended to provide total protection, ideal if your gas boiler is no longer covered by a manufacturer's warranty. Under this plan boiler and system breakdowns are covered.